Carla Broyles Hollands, 58, of Adel, Iowa, passed away Friday, March 29, 2019, at Iowa Methodist Medical Center in Des Moines, Iowa surrounded by her family. Family will receive friends from 4 to 7 PM on Friday April 5th at the First Christian Church in Adel with a prayer service at 7 PM. Pastor Doug Pfeiffer will be officiating. Carla was born on September 8, 1960, in Winterset, Iowa to Carl Lewis “Louie” and Zola (Merical) Williams. 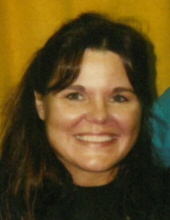 Carla was a graduate of Adel-DeSoto High School. She spent all of her life in Dallas County and had worked at the Dallas County Care Facility as a cook and caregiver for many years. Carla had a great passion for music and doing anything that involved being outside. She had a big heart and was a very giving lady in life and in death. Above all, she was a very loving mother and grandmother. She will be missed by all that knew her. Carla is survived by her mother, Zola (Merical) Williams of Adel; husband, Rich Hollands, Jr.; children, Buc (Angie) Broyles, Sara (Chris) Broyles, Carly (Jason) Broyles, Wyatt (Emily) Broyles, and Josie Hollands; brother, John Williams; sisters, Carol Williams, Julie Gehrke and Jacque Claseman; and grandchildren, Sawyer, Tess, Gatlon, Tucker, Hank, Grady, Zola, Colt, Loudan, and Layla. She was preceded in death by her father, Louie Williams. Memorials may be directed to her family. Funeral arrangements are being handled by Caldwell Parrish Funeral Home – McCalley Chapel in Adel. Online condolences may be left at www.caldwellparrish.com. To send flowers or a remembrance gift to the family of Carla Broyles Hollands, please visit our Tribute Store. "Email Address" would like to share the life celebration of Carla Broyles Hollands. Click on the "link" to go to share a favorite memory or leave a condolence message for the family.